In this video editing activity, students will examine how racism played a role during the 1936 Berlin Olympics. 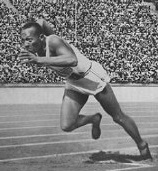 Students will be introduced to the racial policies in place in Germany under the Nazis, as well as the personal stories of athletes who were affected by them, including African American Olympian and track star Jesse Owens, whose civil rights were violated in the United States while the civil rights of Jewish athletes were being violated in Germany. This activity aligns to Common Core and ISTE NETS standards. More information available in the Activity's Tool Kit.